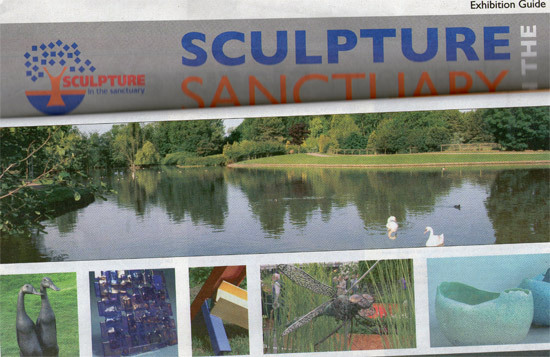 Below I have provided a bit of information about the sculptures and furniture that into 2011 Sculpture in the Sanctuary exhibition. 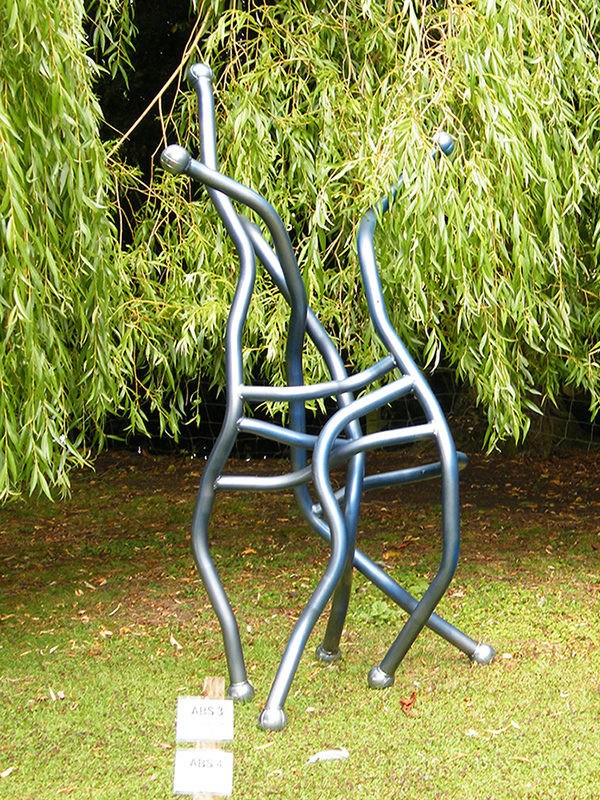 Out of the blue is a metal sculpture created from rolled steel tubing and metal boules. I chose the title as; the idea did literally come out of the blue, it is painted with a range of blues and I am a big fan of blues and rhythm 'n' blues music. 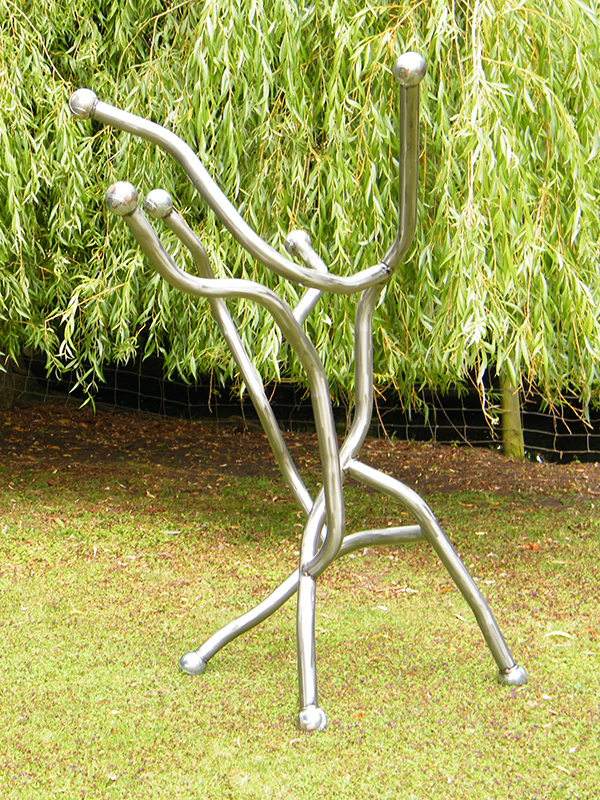 Vidente is a sculpture created from recycled steel tubing and pétanque balls. Part of the process is to rebend the tubing to create my desired shapes and lines - as if drawing in space. 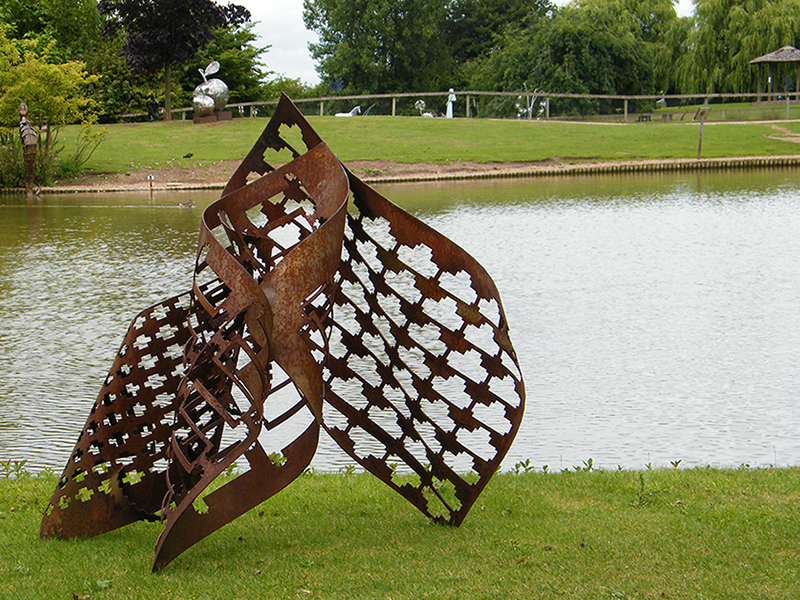 I am constantly checking the sculpture from different angles making sure it works visually from many viewpoints. 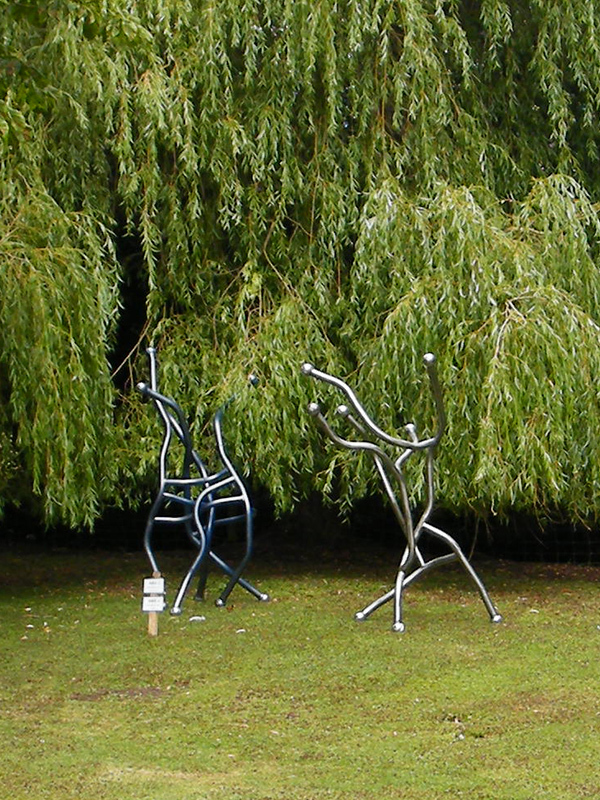 Added to this, the time of day or season will change how the sculpture reacts with the surroundings. And to enhance this the steel tubing has been carefully cleaned with fibre pads to a shiny reflective surface that has been protected with a hard wearing baked on clear lacquer. 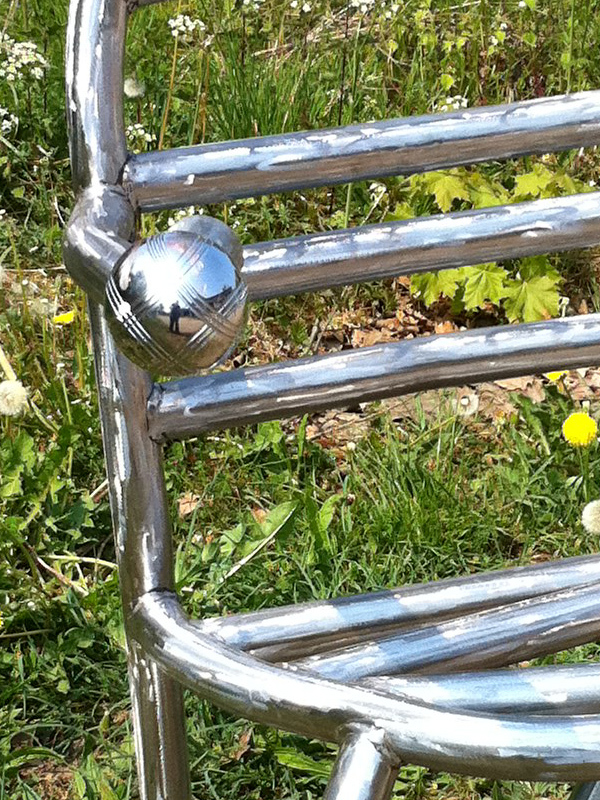 Finally, the chrome finish of the boules create another level of reflection. The name Vidente that means 'seer' in Spanish and the adjectives are 'seeing' and 'clairvoyant. If type Vidente in Google Images you will see many images of Clairvoyants with their crystal balls that reminded me of the shiny boules. 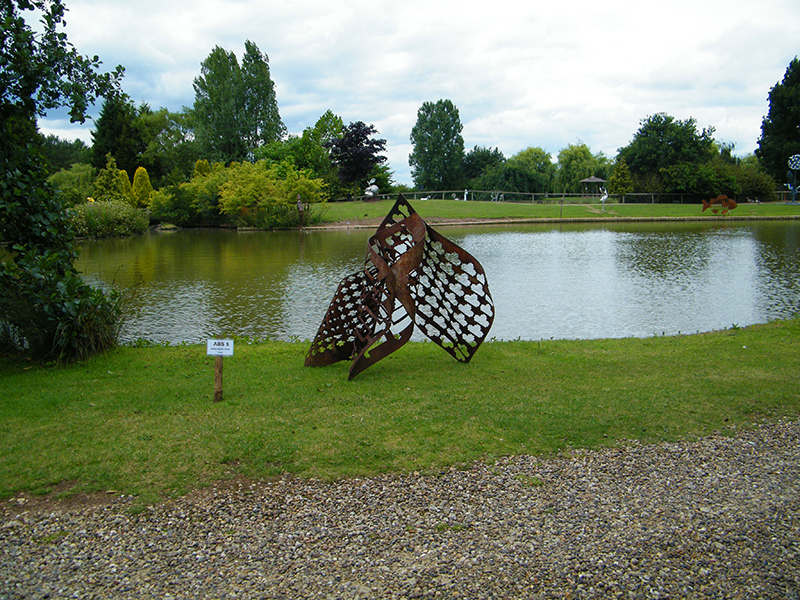 And of course the reflective surface of the sculpture is all about seeing. 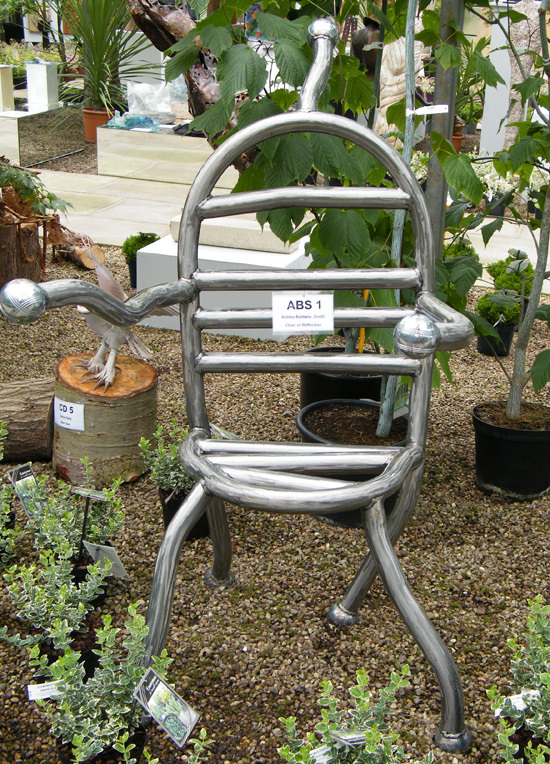 The Chair of Reflection is a new unique, funky and crazy metal chair from Ashwinstudio. 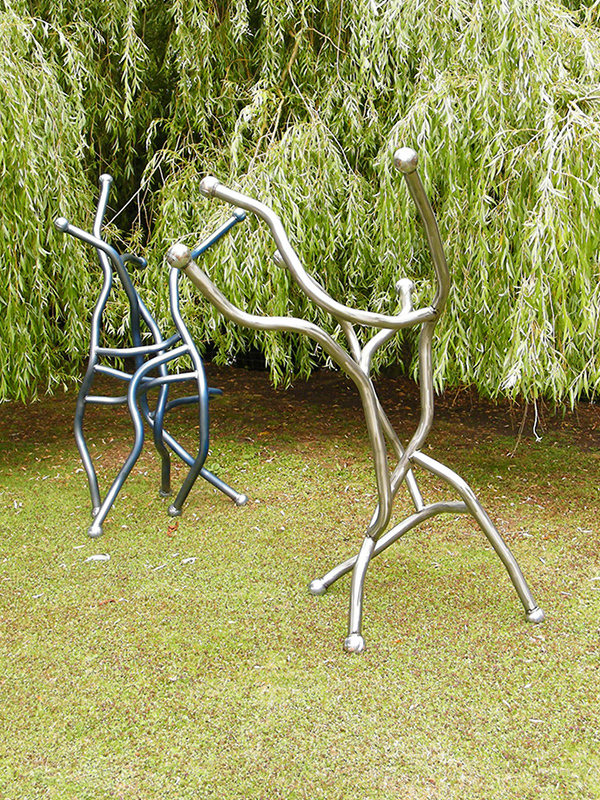 It is created from metal tubing and metal boules with a ground reflective finish. The powder coat clear lacquer finish has been baked on and is very hard wearing. The transparent lacquer also allows the carefully made grind marks to shine through, reflecting the sun and surroundings and that, along with the quirky design, make the chair come alive. Below are various photograghs of the chair (you should be able to spot us in the reflection). 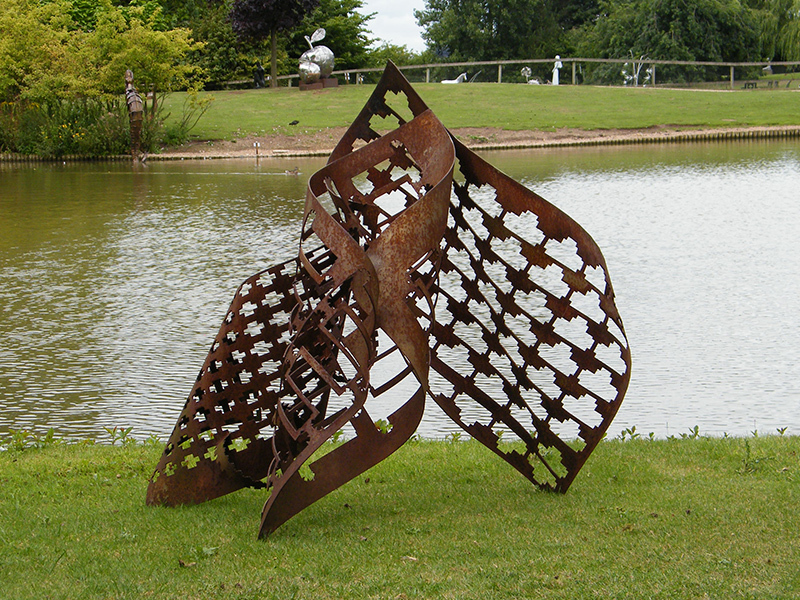 For this sculpture, I first programmed the design, via CAD, then CNC punched the design into the three 3mm sheets of mild steel. Then hand-rolled and shaped the sheets. The next stage was to weld the parts together and final treat the surface with acid, spray paint and allow to rust. Many people have asked what is the meaning behind Lean On Me. 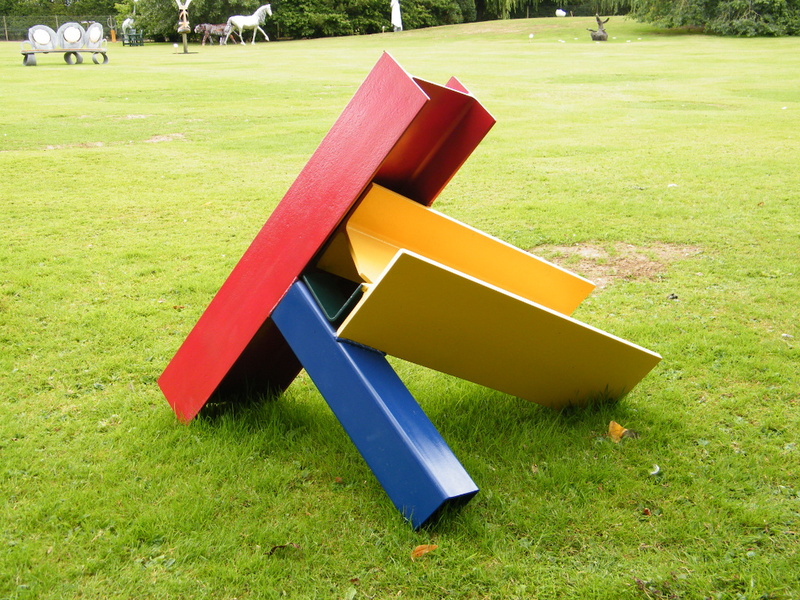 I prefer the viewer to find their own meaning but here is part of my thought process: This sculpture is metaphor for the unsung heroes - for the down trodden - the big, heavy and primary coloured red and yellow girders are supported by the smaller and calmer blue section. However, it is in fact the smallest and insignificant green (secondary colour) angle that holds the whole sculpture together. 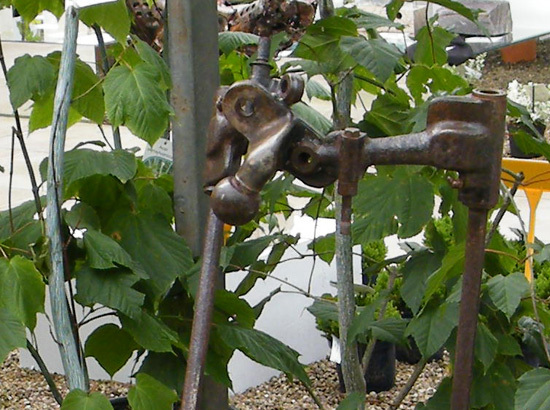 Lean On Me is made from reclaimed scrap metal including RSJ beams and box section. 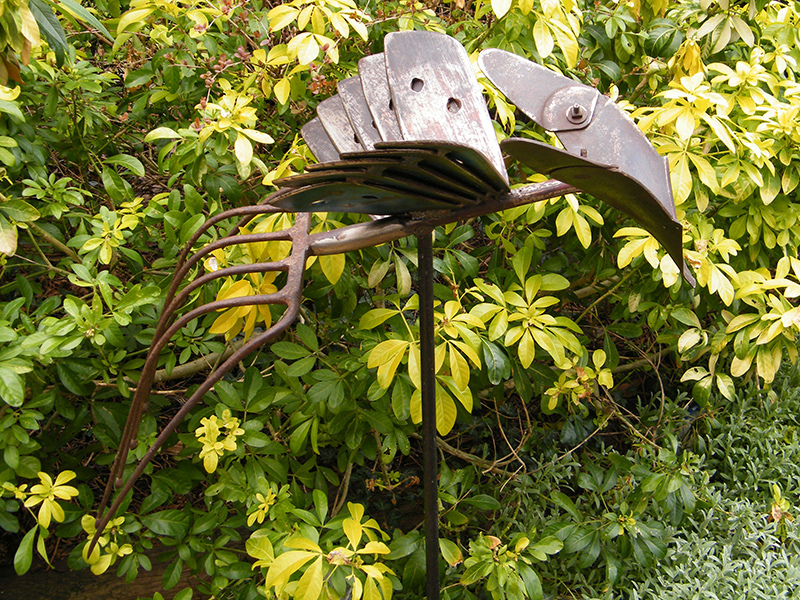 This metal sculpture has been a labour of love, needing countless coats of car paint and lacquer. Not to mention the rubbing down between coats and masking off each section and the hastle of moving it. However, I am very happy with the end result and am looking forward to seeing it on show. 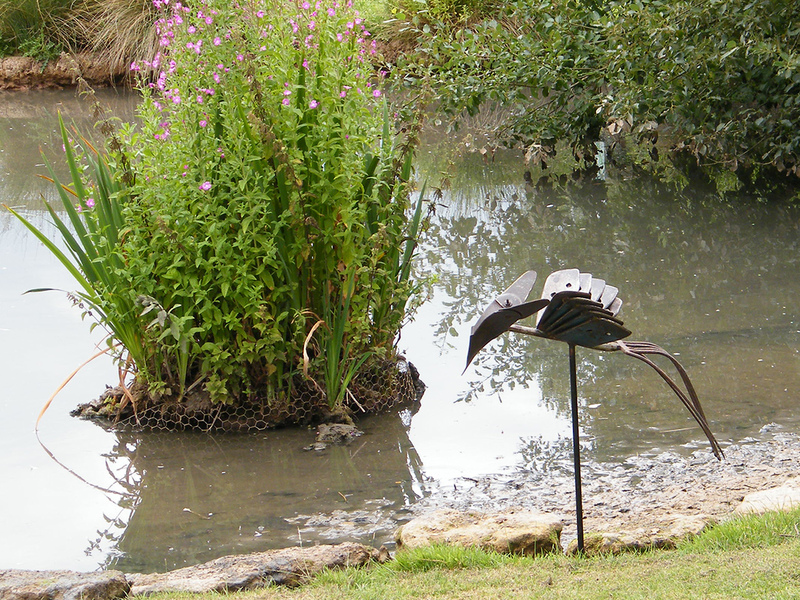 This metal sculpture is created from reclaimed found objects. 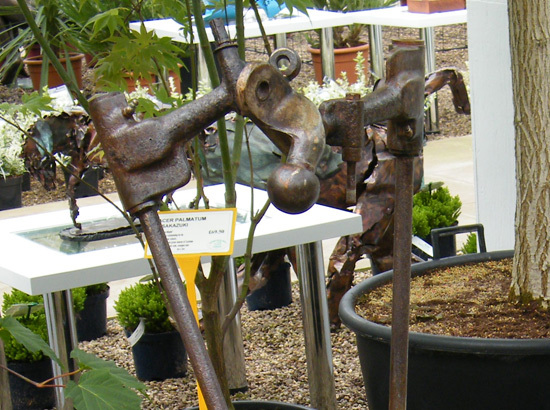 The legs and feet are cut from an old plough, the hips and pelvis are parts from a old van and a tow bar. The base is a an old iron weight, from a weight lifting set, salvaged from knee deep mud and took a lot of cleaning to get through years of rust. It was fun welding as I had to heat the iron first then butter weld with specialist arc rods before I could attach the foot and leg. The weight is has the words 'Body Sculpture' as part of the casting which I used for the title of the sculpture. constructed from found objects. 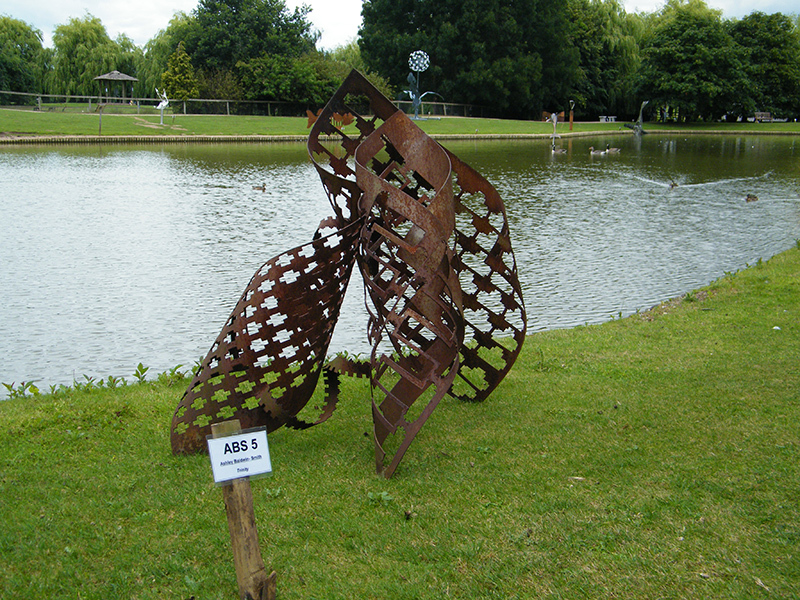 This was one of the very first metal sculptures I constructed. The Ridger is a mythical bird that, as legend would have it, hunted mercilessly for the potato. 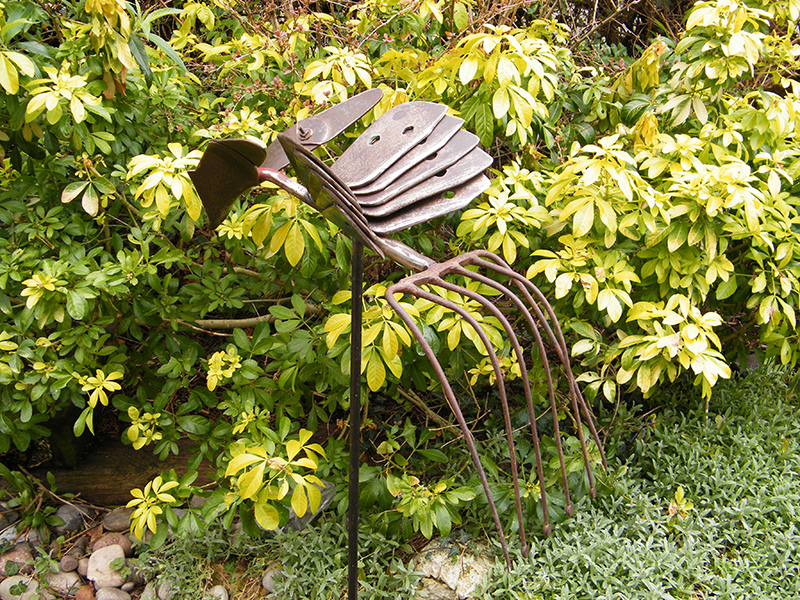 The metal sculpture is created from farm implements; the tail is an old potato fork, the wings are skimmer points from a plough and the head is a ridger for earthing up potatoes.